West Potomac Park is a national park in Washington DC adjacent to the National Mall, west of the Tidal Basin and the Washington Monument. Most people consider this area to be a part of the National Mall as it includes some of the most popular attractions in the nation's capital. It is the site of many national memorials, including the Vietnam, Korean, Lincoln, Jefferson, World War II, Martin Luther King Jr. and FDR memorials. West Potomac Park has 1,678 cherry trees that blossom each spring and are the focal point of the National Cherry Blossom Festival. Other attractions include Constitution Gardens, the Reflecting Pool and several sports and recreation fields. 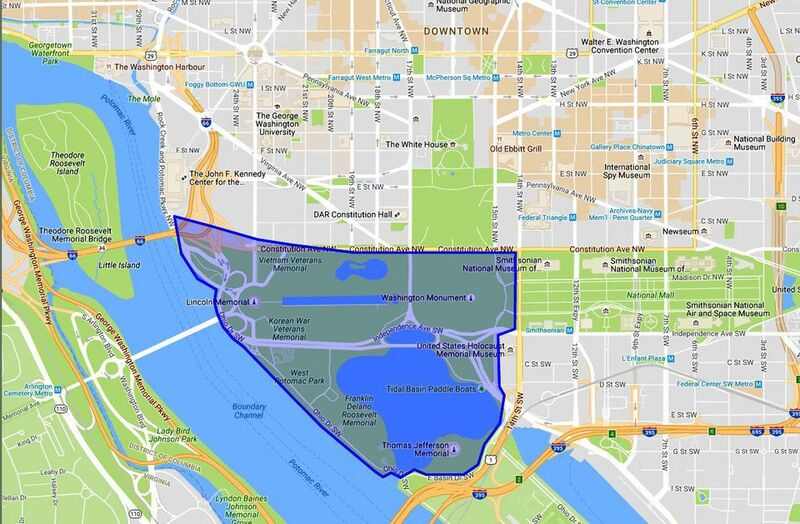 This map shows the location and boundaries of West Potomac Park. The park is located just south of The White House, west of most of the Smithsonian Museums, northwest of East Potomac Park and Hains Point and east of the Potomac River. It is accessible by car by crossing into the District of Columbia from Northern Virginia via I-66 E (the Theodore Roosevelt Memorial Bridge) and I-395 N (14th Street Bridge). Parking is very limited in West Potomac Park. The closest Metro stations are Smithsonian and Federal Triangle. Vietnam War Veterans Memorial - The memorial pays tribute to those who served in the Vietnam War and is one of the most visited attractions in Washington DC. Korean War Memorial - Dedicated to 1.5 million American men and women who served in the Korean War from 1950-1953, the memorial includes larger than life-sized statues of war heroes. Lincoln Memorial - The iconic symbol of Washington DC is a tribute to President Abraham Lincoln, who fought to preserve our nation during the Civil War. Jefferson Memorial - Honoring our third president, Thomas Jefferson, the national landmark is one of the most prominent sites in Washington DC. World War II Memorial - The expansive memorial with its 50 pillars representing the states and its vibrant water fountains, honors Americans who served in the second world war. Martin Luther King Jr Memorial - The memorial honors Dr. King’s national and international contributions and vision for all to enjoy a life of freedom, opportunity, and justice. FDR Memorial - The accessible memorial honors President Franklin D. Roosevelt for leading the United States through the Great Depression and World War II. Constitution Gardens - The 50 acres of landscaped grounds includes an island and a lake that are home to numerous ducks, geese, and other birds. The Tidal Basin - The inlet drains the Washington Channel and provides recreational green space.